But who has the best music taste? Derry Girls is back and once again dominating the pop culture conversation. The season two opener provided much in the way of laughs, getting a big reaction from the public. JOE had the chance to catch up with the cast, getting an insight into Nicola Coughlan's cliff-based heroics, what to expect from the season overall, and how the cast got on with their new co-stars. There are many aspects to what has made the Channel 4 show such a hit so far, from the acting to the writing to the chemistry of those onscreen. Another key factor is the music, which manages to both give a strong sense of and time place to proceedings, but also lends extra depth to the characters. 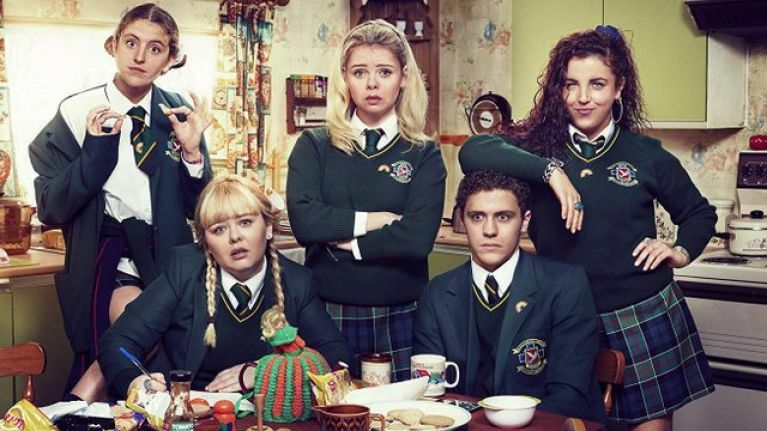 Whoever is in charge on the selections and licensing front has done a great job so far, which is reflected in Derry Girls' official team up with streaming platform Spotify. That's right, all the main players - Erin, Orla, Clare, Michelle, James and Sister Michael - now have they very own unique Spotify playlists for you to enjoy and judge accordingly. So who's into what, then? Erin's playlist goes big on pop, with classics from Spice Girls, Take That, Sinéad O'Connor and TLC leading the way. 'Zombie' by The Cranberries also features. Orla's effort gets points for including Ricky Martin stomper 'Livin La Vida Loca' alongside Massive Attack's 'Teardrop' and Björk's 'It's Oh So Quiet' - can't say that's not eclectic. Clare's playlist is also lined with well-known favourites such as Five's 'Slam Dunk da Funk', 2 Unlimited's 'No Limit', and, of course, PJ & Duncan triumph 'Let's Get Ready to Rumble'. Why not. As for Michelle, James and Sister Michael, it really is a 'who's who' affair, with everyone from David Bowie to Nirvana to Fatboy Slim getting the nod. Check them all out and follow along accordingly right here.